I’ve seen some of you switched to DST over the weekend. Hope it didn’t ruin your morning sleep, in case you had to be somewhere early on Sunday. We still have to wait for a little less than 2 weeks before the change and I already know now that I’ll forget all about it until I wake up on that Sunday and realize that I slept one hour less. What’s good is that I only have one clock I have to change manually, so at least that’s easy. Anyway, before DST happens, I have something more exciting going on. I am counting down the days, 5 days to be exact, till Sunday. That is the day that this season’s ski jumping World Cup ends and we have tickets for the final competition! And one of our jumpers is getting the Crystal Globe. How amazing is that! I’m already thinking about the snacks I want to bring with us, because it’ll take us a few hours to get there and back. The train leaves at 6 AM, so I need food and coffee or I’ll be cranky all the way. But really the only thing I’m worried about is the weather, since the competition is pretty much dependent on it. I’m hoping for no rain, snow or crazy winds. I think I’ll pack some sandwiches, granola bars and similar food, but definitely nothing difficult to carry in a backpack and no fruit. I love fruit, but it doesn’t seem like a good fit for this trip. But speaking of fruit, what’s your favorite? I usually have a banana first thing in the morning, with coffee, before a proper breakfast a few hours later. But then throughout the day I love to snack on whatever is in season. I absolutely love berries and pineapple. And about pineapple, I really hate peeling it. Especially if it’s a large one. It’s one of those things that seems to take forever, but I do think it’s so worth it, because nothing beats a freshly peeled pineapple. 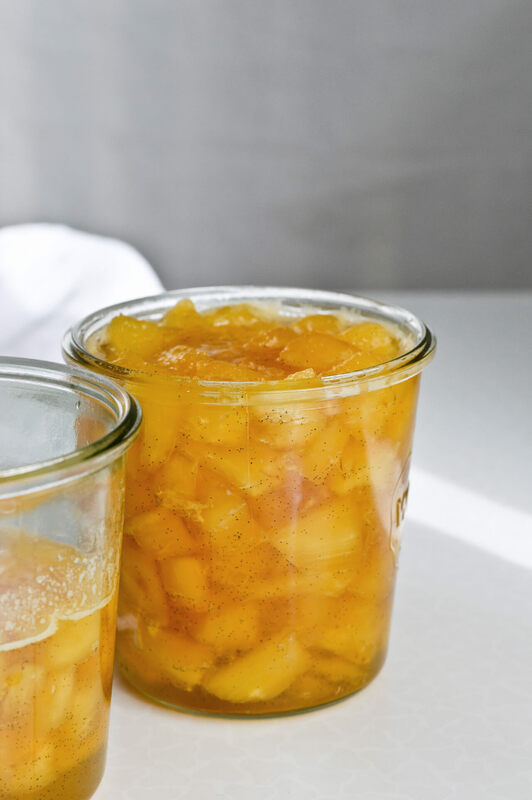 Although these vanilla pineapple preserves come pretty close! 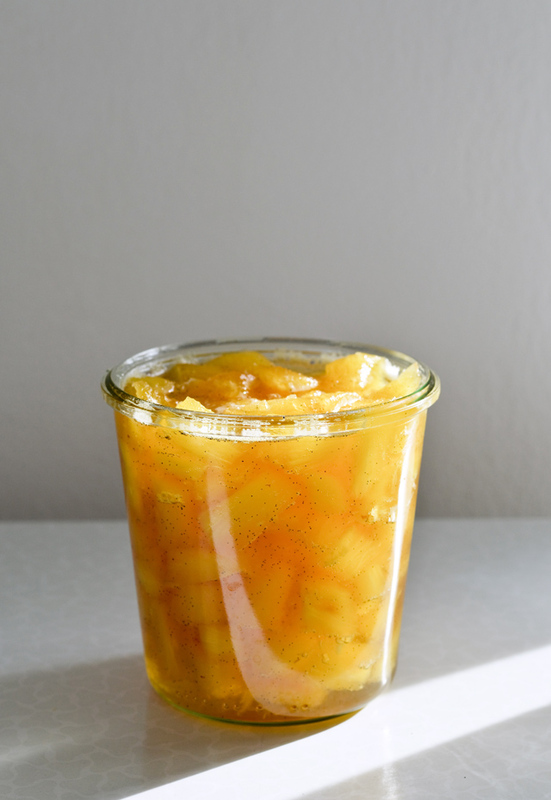 I wanted to make my own preserves, or a compote, instead of buying a can, which truthfully I used to do all the time. 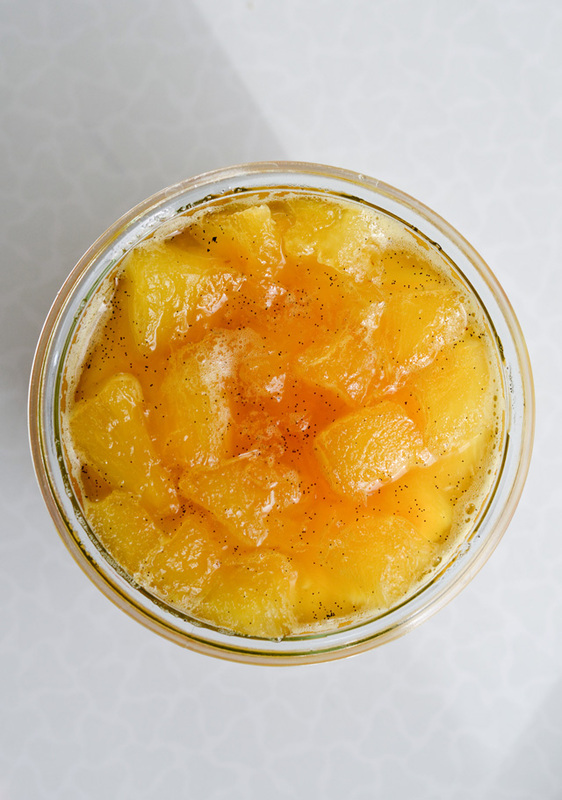 One of my favorite summer treats has always been vanilla ice cream topped with pineapple preserves. If I’m really in the sugar zone I also add whipped cream and chocolate sauce. Ugh, just writing about this makes me hungry. 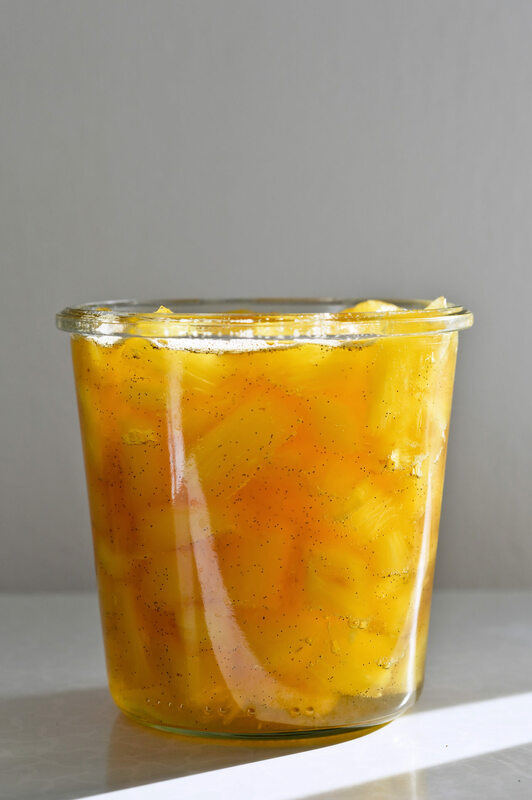 Anyway, these vanilla pineapple preserves are made by firstly soaking the pineapple in a mixture of lemon juice and sugar, with the addition of a halved vanilla bean. I first saw this done by Kris at Prospect The Pantry, and I adapted my recipe from hers. Her process is a bit different, because she’s preserving the pineapple for a longer shelf-life, whereas I will be using mine pretty much right away. She also adds rum to hers, so it’s worth checking out! 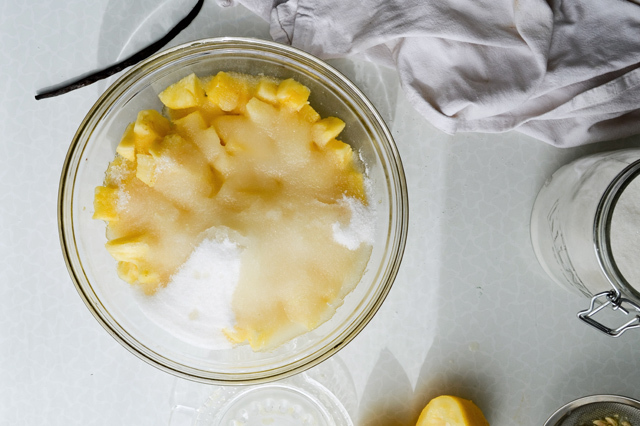 After soaking the pineapple for 1-2 hours, the mixture needs some cooking during which you’ll just die from the wonderful smell that will fill your kitchen. The aroma of sweet pineapple, fresh lemon and an abundance of vanilla is absolutely amazing. It’s dreamy enough that if you close your eyes you can picture yourself sitting by a pool or the ocean, with a warm breeze caressing your skin and nothing but the sound of birds chirping in the air. 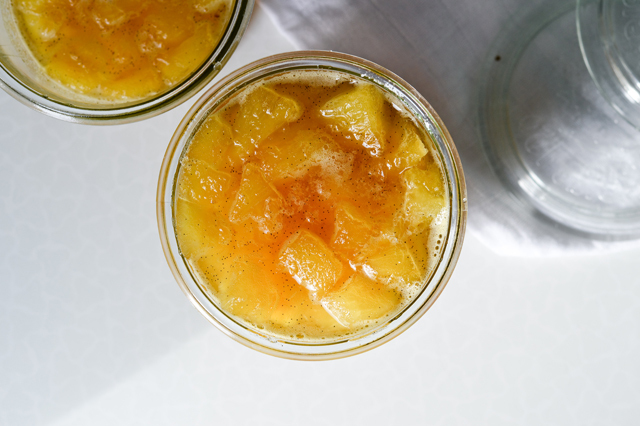 These vanilla pineapple preserves are sweet, with tender pineapple chunks swimming in light vanilla syrup. Add them to your yogurt or granola. Put on pancakes, ice cream or cheesecake. Blend in a smoothie. Use in your frosting when making a cake. The possibilities are endless (and they all sound so damn good). Great addition to ice cream, yogurt, pancakes or your morning granola. Also great in cakes and cheesecake. Recipe makes about 800ml or 3 1/3 cups pineapple preserves. Start by peeling the pineapple and be careful to remove all the woody “eyes”. Cut it into small chunks and add to a large bowl. Add the sugar and lemon juice and stir to dissolve the sugar. Halve the vanilla bean and scrape the seeds into the pineapple mixture. Add the pod to the mixture also. 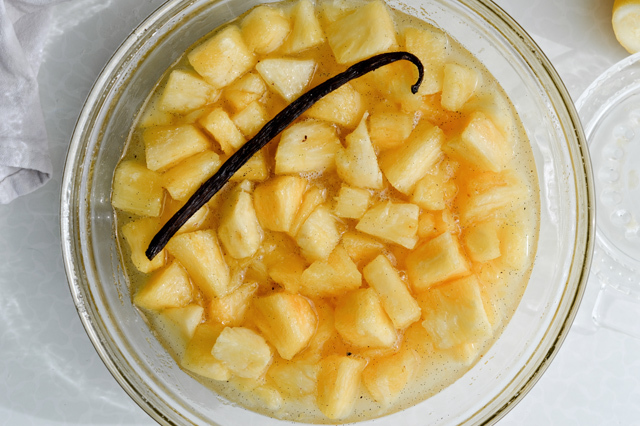 Drain the liquid into a large, wide saucepan, preserving the pineapple and discarding the vanilla bean pod. Set the fruit aside. 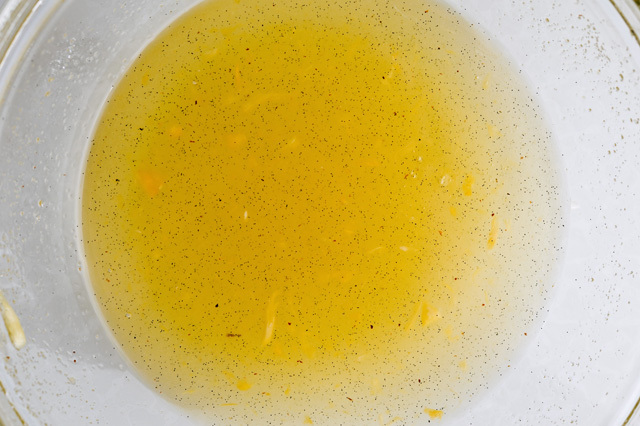 Bring the pineapple liquid to a light boil over medium heat and cook for about 15 minutes, so any undissolved sugar melts and the liquid reduces a bit. 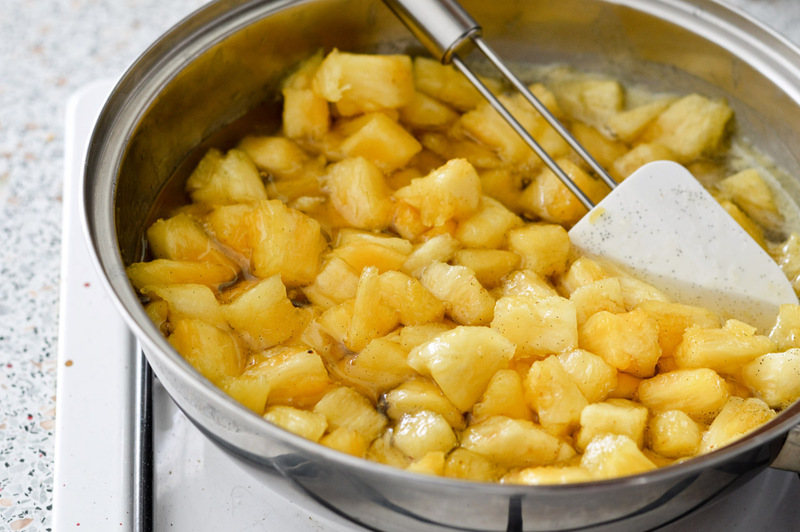 Add the diced pineapple to the liquid and simmer for 30 minutes, until the fruit is fully cooked and the mixture seems well assimilated. 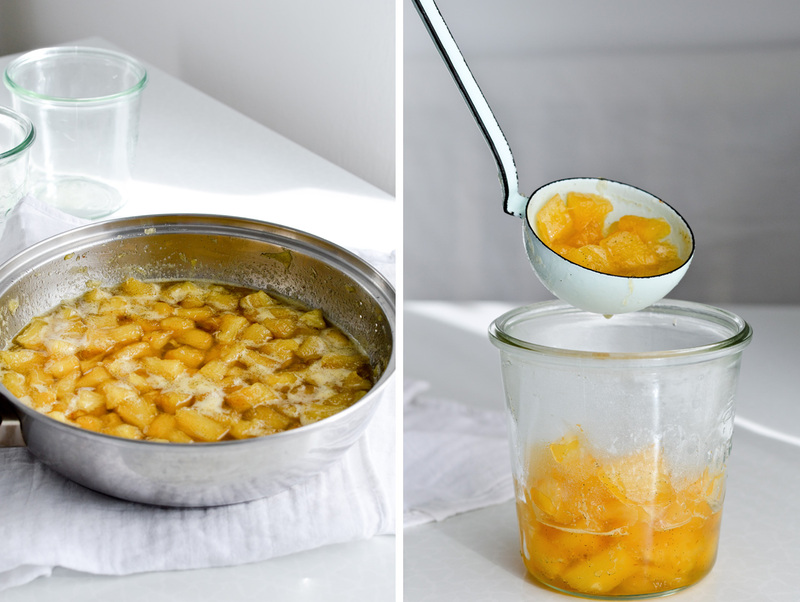 Pour into the prepared jars, cover with a tight-fitting lid and let cool on the counter. Then store in the fridge for up to 3 months. Recipe adapted from Prospect, the Pantry where you can also find detailed instructions for water bath canning. 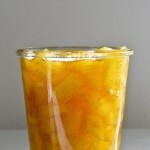 [update March 26]: You can also make similar preserves with canned pineapple, if you only want to use them as a topping. 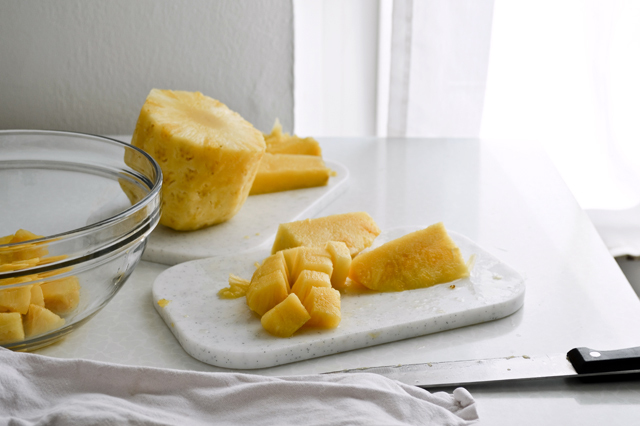 Drain and rinse pineapple slices from one large can (usually about 800g or 20oz) and chop them into small pieces. Combine 1 cup sugar, 1/2 cup water and beans from 1 vanilla bean pod in a saucepan and bring to a boil over medium-high heat. Cook for about 3-5 minutes, stirring often, until the mixture reduces a bit. Add the pineapple chunks and cook for a few minutes, then remove from heat and cool. Use within a few days.